Hiking and biking routes on the lower Sunshine Coast are many and varied. I think I've mentioned a few times that most trails are not meant to be ridden in isolation. Instead, most often you will ride or hike a trail in combination with one or several other trails. It will depend on the area you are in, the length of the trails, how far you want to go and how many trails are in that area. Because I ride or hike everyday, I thought I'd start to document my favourite routes and share them with you. Do you have a favourite trail or route you'd like to mention? Scroll down to the bottom of the page and share it! 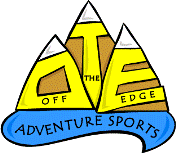 Off the Edge Adventure Sports in Sechelt offers bike rentals and guided rides for all ages and abilities. Click on their logo to visit their website. Need to rent a bike? Spin Cycles Bike Store rents bikes for all types of riding, all year round. Many of the routes listed are over two hours if you are hiking and will likely take you an hour or more if you are riding. Most are also loops or circles, because this is my preference. I much prefer hiking or biking a circle route so that I don't have to retrace my steps and cover the same trail twice. However if there is a great destination to get to like a lake, then I will do the there and back. I have listed routes by area to make it easier for you. Desoto Ridge is a beautiful hiking and biking route in the West Sechelt/Big Tree area. Hiking time is about 2 to 2 1/2 hours and biking will be somewhat less. Excellent trails take you through the Big Tree Recreation area, up Skullduggery and then across Overeasy to the Ridge and Rock and then back down again..
Carlson Lake is a very popular destination for fly fishermen, dirt bikers, atvers and 4X4ers. It is also a fantastic place to hike or bike into. Have a great trail or route you'd like to share? Do you have a favourite trail or hiking/biking route here on the Sunshine Coast? We'd love you to share it with us! Your information will appear on a Web page exactly the way you enter it here. You can wrap a word in square brackets to make it appear bold. For example [my favourite trail] would show as my favourite trail on the Web page containing your information. TIP: Since most people scan Web pages, include your most important information in your first paragraph. Important Note: The maximum image size accepted is 800x600. You will need to resize any photo larger than 800x600 pixels using your own graphics software or a free Web-based resizer, such as Picnik or Picasa before uploading. Click here to return from Hiking and Biking routes to the Sunshine Coast Trails Home page. Would you like a hard copy of the information from this website? Sunshine Coast Trail Map - a 17" X 22" water-resistant map of all the trails on the Sunshine Coast. Sunshine Coast Trails - a compilation of all of the areas trail descriptions and maps. Sunshine Coast Hikes and Bikes - some of my favourite routes.